Here is a list of my current short story publication credits to share with my dedicated readers. Thanks for your support! TULIPTREE PUBLISHING: A literary journal featuring fiction, nonfiction, and poetry. They feature an annual “Stories That Need to Be Told” contest and publish an anthology of winners. TulipTree Publishing chose my short story “Fruit Punch” which tells the story of a man who, upon returning to his fifteen year high school reunion, still finds he is enchanted with a woman he met when he was ten-years-old. They also publish fundraising books that benefit a variety of worthy causes. STORGY: As an online literary magazine, STORGY seeks to “publish and promote exceptional literary fiction while providing authors with the opportunity to reach a wider literary audience” Looking for innovative fiction that examines the human condition, they published my short story, “Eyes Flies.” This dark and experimental narrative was inspired by my own life experiences, where a young man wakes up every morning to find an increasing number of flies mysteriously buzzing around his kitchen. THE 1888 CENTER: Located in the historic district in Old Towne Orange, California, The 1888 Center is a bookstore and cafe with a mission to celebrate art and artists. For their site, they published my short essay, Why I Write, on their page that collects author motivations. If you’d like to read the essay yourself, click the link and scroll down or search “Teeny” to read why I write. SEQUESTRUM: Sequestrum Literature & Art is a collaborative journal from Iowa State University and the University of Iowa, publishing new, emerging, and internationally-acclaimed writers. For their annual “Editor’s Reprint Award,” my story, Recalling the Cold, was a finalist, ranking it among the top 5% of all submissions. The story follows three WWII prisoners of war, and how they decide on a life or death situation. CONCLAVE: A publication of William Bernhardt and Balkan Press Books, Conclave heralds itself as a “journal of character,” which selected my piece To Know the Difference for publication in their spring issue, “Voices from the Edge.” A fitting tale for the specific issue, the story examines how a high school boy appeases his violent soul and what happens when the class bully torments him to his limits. FALL LINES: Published once every summer, the literary journal Fall Lines is the product of collaboration between The Jasper Project, Muddy Ford Press, Richland Library, and One Columbia for Arts and History of South Carolina. For their annual release, they selected my piece, “Law of Averages,” which tells the story of Andy, a gas station employee, and his encounter with a very strange, nearly inexplicable customer on a sluggish summer night. FABULA PRESS: Every year, Fabula Press runs two short story competitions—“Aestas” in the summer and “Nivalis” in winter. For their winter edition, my story, How It’s Always Been, about the beauty of falling in love and the inevitable heartache that comes to follow, made it as one of the sixteen finalists in their Nivalis Short Story Competition. The piece will thus be published in their ensuing anthology. A MURDER OF STORYTELLERS: The literary journal A Murder of Storytellers put their six editors to work as they reviewed submissions for their new anthology of short stories, The Book of Blasphemous Words. Combining tales of horror and fear, this collection aims to capture humanity’s dark relationships with its gods. For this anthology, they selected my flash fiction piece, “The Damned,” which tells of one soul’s suffering in the great beyond. MYSTERY WEEKLY: Featuring crime and mystery stories from both established and emerging authors all around the world, Mystery Weekly is one of the foremost stops for criminal short stories. And for their November 2016 issue, they selected my piece, Terrible Tilly, as the cover story for publication. Re-imagining life on one of America’s most dangerous lighthouses, the story follows four men on a blustery night, who not only vie to survive the dark sea but also the dark intentions of one among them. INTRINSICK: Home of the “funny, unsettling, and what-the-eff stories,” Intrinsick magazine seeks work that makes you feel uneasy after reading it but wanting to laugh, even though you know it’s probably in poor taste to do so. For their upcoming publication, they selected my short story, The Most Interesting Person at Work. Although it begins with a normal person’s ordinary day in the office, the reader quickly comes to realize: “what the eff” is up with Barbara F. Martins? SCI PHI JOURNAL: Based out of Australia, Sci Phi Journal is an online literary magazine that publishes stories exploring the questions of life, the universe, and everything else that delves into the deep philosophical waters of science fiction. They selected my piece, “The Back of Stars“ which considers the theory of infinite universes and what it would mean to fall in love with a woman who doesn’t live within your own. SATURDAY EVENING POST: As the longest standing literary journal, The Saturday Evening Post has chronicled America over 300 years, consistently providing art and entertainment from writers like Ray Bradbury, Agatha Christie, William Faulkner, F. Scot Fitzgerald, and Kurt Vonnegut. For their 5th Annual Great American Fiction Contest, they selected my story, “Welcoming Death” as runner up. If you died, would you be able to pass Death’s tests for another shot at living? ST. LAWRENCE BOOK AWARD: Although individually my stories have had success in various journals and competitions, a collection of my short stories, titled Water off a Raven’s Back, was selected as a semi-finalist for The St. Lawrence Book Award. The collection included a variety of stories I have already received some success with as well as other yet to be submitted. The St. Lawrence Book Award itself has been around for over a decade and seeks “innovative, electrifying, and thoroughly intoxicating” manuscripts. MONICA SCHREIBER PRIZE: Awarding cash prizes to the funniest article, short story, poem, or even shopping list, the Mona Schreiber Prize for Humorous Fiction and Nonfiction has been amusing readers for over 15 years. This year, my story, “Firing Myself,” won 1st place in their competition. The short, humorous piece is about exactly what the title describes: How can this average narrator get himself spectacularly fired? IMITATION FRUIT LITERARY JOURNAL: Since 2007, Imitation Fruit Literary Journal has published work by local writers in the San Francisco and Bay Area as well as writers from all over. For their “Big Decision” contest, my entry “The Price of Life” won first prize! Check out the journal and read the story where in a futuristic world, the impoverished are forced to compete on a game show in which they must choose between life and wealth–neither being the better option. SHORT STORY AMERICA CONTEST: The prestigious 2015 Short Story America Contest prize for short fiction is an international competition that seeks literary works which “advance the modern short story.” For their 2015 competition, they awarded my story, “Terrible Tilly,” honorable mention. This piece of historical fiction re-imagines life on America’s most dangerous lighthouse, where on a tiny, basalt island, four men must not only survive the raging sea around them, but the claustrophobia eating at their sanity. 365 TOMORROWS: Since 2005, the online flash fiction magazine, 365 Tomorrows, has been publishing short science and speculative fiction. For “observed” Independence Day, then, how fitting for them to publish my flash fiction piece about an approaching alien attack, Along It Came. Will humanity live? Will the aliens conquer? PROSE ‘N CONS: A quarterly magazine for fans of mystery, crime, and suspense, Prose ‘n Cons focuses on short fiction, interviews, personality profiles, and entertaining features about investigation, criminal justice, and forensic science. They selected my short story, “The Violence Beneath,” for publication. A tale of a psychotic psychology professor, a cynical detective, and the hunt to save a kidnapped girl, this story is a quick-paced bout of suspense. EASY STREET MAGAZINE: Some times it only takes a few words to leave a lasting impression–as was the case when I placed as a finalist in “The Great American Sentence Contest” in Easy Street Magazine. Receiving over 2,100 sentences, mine was of the top .004%. That sound too crazy? Check out the sentence to judge for yourself. THIRD FLATIRON PUBLISHING: Established in 2012, Third Flatiron Publishing purchased my piece “Toward the Back” for their 2014 anthology of science fiction and fantasy stories, “Abbreviated Epics.” Set in a magical world, my piece takes a humorous spin on the fantasy genre, following the tale of two cowardly, metrosexual orcs as they reluctantly descend into a battle that will determine the fate of the world. MAGICAL: My piece “One Foggy Thieving” was selected for publication as well as a finalist in the top ten stories of the book “Magical: An Anthology of Fantasy, Fairy Tales, and Other Fiction for Adults” by Kelly Ann Jacobson,. The anthology comprises pieces of “exceptional magical fiction written in a literary style that is both entertaining and spellbinding.” And my story, a retelling of the classic Warner Brother’s cartoon about the man who discovers a singing frog, apparently fit that description. GEMINI: A magazine for stories “where everything seems a little off and nothing’s quite like it should be,” the literary journal Gemini awarded my piece, “The Favor” honorable mention and publication in their autumn magazine. The story itself is about a seemingly innocent teacher, Mr. Jackson, who, while patrolling his grade school’s recess time, is approached by a strange man with an even stranger proposition. THE WRITING DISORDER: A Los Angeles based, online literary journal devoted to literature, art, and culture, The Writing Disorder, selected my piece “Recalling the Cold” for publication in their Summer issue in June 2014. Read the story which is set during World War II in a prisoner of war camp, where three American soldiers, isolated from the rest of the camp, are tortured daily. One morning, however, along with their breakfast, comes a pistol with a single bullet. Uncertain who gave it to them and for what reason, the three men must decide what to do with it—or more courageously, what not to do with it. SHIPWRECKT BOOKS: Indie publishing company (out of Lanesboro, MN) Shipwreckt Books, chose to publish my piece, “Warm Sundays” in their May 2014 issue of “Lost Lake Folk Opera Magazine.” The story, stemming from personal experience, is about a young boy’s desire to be respected as “a man” among his family of hunters. Check out the Shipwreckt Books website to see all their imprints. RIVER STYX: Nearly three hundred entries were received for the River Styx Schlafly Beer Micro-Brew Micro-Fiction 8th Annual Contest, and my flash fiction piece “Firing Myself” made it to the final round of twelve selections. The story is about a man who comes into work set on quitting his job; first, though, he needs to decide which of his extravagant plots for resigning is most suitable. River Styx magazine began in the early 1970s and publishes three times a year. WESTMORELAND ARTS & HERITAGE FESTIVAL: An annual event that celebrates the arts and attracts over 150,000 people, the Westmoreland Arts & Heritage Festival hosts a literary competition in which my piece, “Warm Sundays“ won third place. The short story is about a young boy’s drive to become a man, to become a hunter. But wishing and achieving are two very different activities, and when the narrator is confronted with attaining his first kill, he finds it much harder to shoot a bird than just pulling the trigger. SOUL-MAKING KEATS LITERARY COMPETITION: Originating in 1992, the Soul-Making Keats Literary Competition is an annual writing contest with thirteen categories that receives submissions internationally. In the short story category, I was awarded honorable mention for my piece, “So Burn the Coals.” And in the flash fiction category, I was awarded 3rd place for my piece, “Violet Candles” for which, there was a $25 prize. What a way to start the new year! NEW MILLENNIUM WRITINGS: Having featured writers such as Cormac McCarthy, J.D. Salinger, and Ken Kesey, New Millennium Writings is a literary magazine that showcases work filled with “vibrant imagery, word-craft, and pure story-telling talent.” This year, they awarded honorable mention to my story, “The Collectors” a dark tale of violence about two brothers bent on revenge. The list with myself and other winners can be found at New Millennium Writings. THE HIGGS WELDON: Two Los Angeles comedians have put together The Higgs Weldon — a comedic literary web magazine that publishes written works and cartoons Monday through Friday. In late September, they published my flash fiction humor piece, “Dreamluxe FR-970 Computer Chair Assembly Manual,” a satirical, twenty-step process on how to put together an “out of the box” computer chair (which I have had the unfortunate pleasure of assembling many times before). GARBANZO LITERARY JOURNAL: For their third volume, Garbanzo Literary Journal (which publishes through the iBookstore as well as offering hand-created books and features work that is “whimsical and full of light, even though some of the subject matter and form is dark”) selected my piece “A Kiss from the Moon.” In review of my work, one editor wrote, “The story is so wonderfully moving, so balanced at so many moments on the precipitous edge of heartbreak, and heartache, but somehow, in the midst of it all – the hope, the hope that it is never too late reaches the reader in the most quiet of ways.” Garbanzofest 3 featured live and recorded readings from the storytellers, local musicians and lots of hummus. A video of myself reading “A Kiss from the Moon” can be found at my youtube channel at http://youtu.be/kt41zEW8olw . GARBLED TRANSMISSIONS: An online magazine of science fiction and fact, Garbled Transmissions features new fiction and reviews of books, comic books, movies and games and selected my piece “As Evening Descends” for publication. Set in the 1970s, a man is out hunting in the forest one evening when a Greyhound bus all of a sudden drives wildly up an old logging road and crashes. Flabbergasted, the narrator approaches the bus and helps the survivors back to his cabin. But when he wakes up the next morning, his concern is no longer just the long hike to the ranger’s station: the survivors seem to have disappeared. Read the story and explore the site at As Evening Descends. BARBARIC YAWP: A literary magazine that is self-described as, “Fiction with bounce and surprise. A publication intended for the intelligent, open-minded reader,” Barbaric Yawp published my piece, “Inquisition” a fantasy-comedy about an irritated torturer forced to interrogate a most uncooperative and rather cheeky client. ROSE & THORN JOURNAL: An on-line literary journal that sadly published its final volume, Rose & Thorn Journal selected “So Burn the Coals” for their last issue of publication. This piece had been previously nominated for honorable mention in a separate contest. 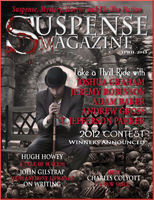 SUSPENSE MAGAZINE: Considered as an on-line “insider source of Suspense, Mystery, Thriller and Horror Fiction,” Suspense Magazine “Reflections” is a 2,500 word psychological thriller set in the tumbleweeds of New Mexico and was chosen as one of the short story contest submissions in their 4th Annual Writing Contest. If you support the magazine through a subscription or buy the February 2013 (digital) issue for $4, you can read “Reflections” on page 50! The magazine has wonderful artwork and appeal. EVERYDAY FICTION: As on-line magazine that publishes “a new short story of 1000 words or fewer that can be read during your lunch hour, on transit, or even over breakfast, Every Day Fiction published “The Magic of a New Suit” explains what happens to Dennis O’Connor when he alters the clothes he wears in a most unusual way. Feel free to leave a remark about the story in the comments section! ART AFFAIR: Shadetree Creations is host to an annual poetry, short story and western short story contest sponsored by Art Affair. My entry “So Burn the Coals” received honorable mention in the 2012 Annual Art Affair Writing Contest. Set in the 1880s, it is the story of a troubled bounty hunter, his mysterious prisoner, and the confessions that emerge beneath a starless night. MILITARY TIMES: The newspaper Military Times held a “Family Love” writing contest for people with loved ones in the armed forces and my entry as a Navy brother, “Personal Patriotism” was one of the selected essays printed.